Richard DuFour states clearly that "the purpose of our school is to ensure all students learn at high levels". The purpose of education is learning and not competition yet we often compare students against each other instead of focusing on each student's progress. As a result, when a student fails to meet the standards we think is appropriate for a given age, we agonize on whether to promote or retain without even considering the fact that learning takes time and the amount of time varies naturally from one child to another. We frequently equate the speed a child learns with smartness in spite of knowing that a child's background greatly influences a child's performance in school. Thus, when a child fails, we do not even consider the possibility that failure often means requiring more time, allowing a child to grow. 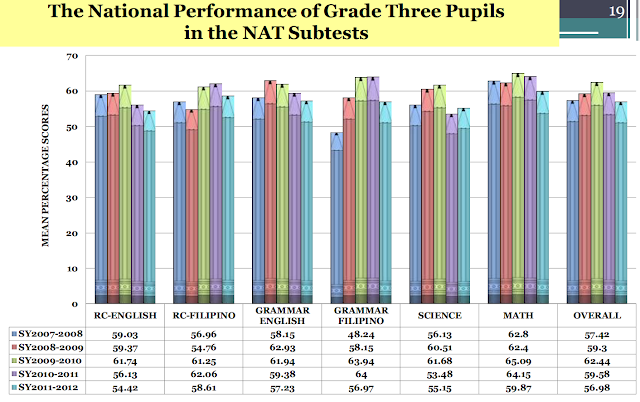 In fact, the National Association of School Psychologists has long stated its position regarding retention: "Given the frequent use of the ineffective practice of grade retention, NASP urges schools and parents to seek alternatives to retention that more effectively address the specific instructional needs of academic underachievers." 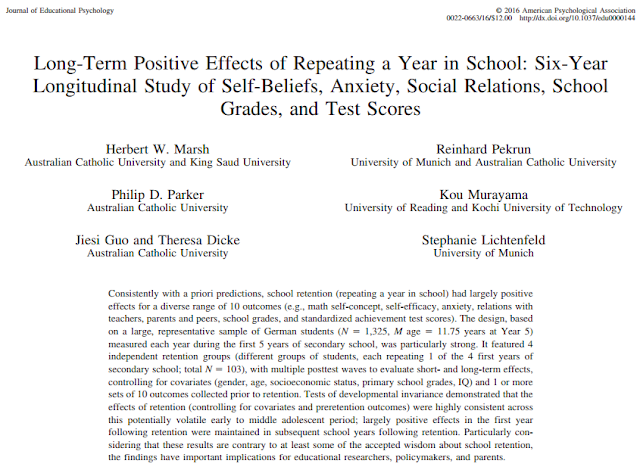 Retention, however, has been considered as ineffective mainly because of its "social effects". 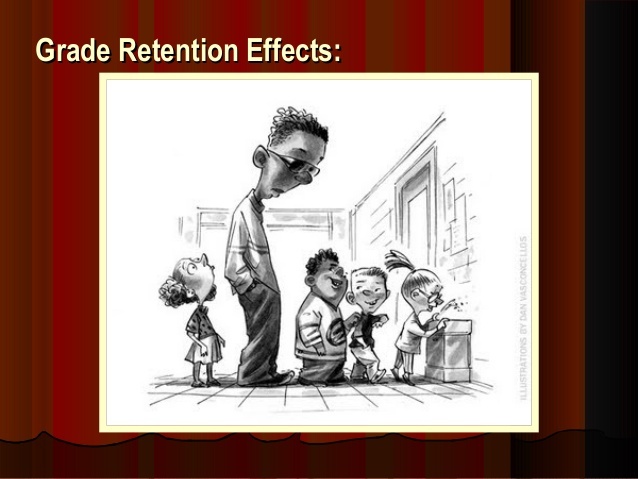 These effects, unfortunately, are not direct outcomes of retention, but of our own perception of what retention means. 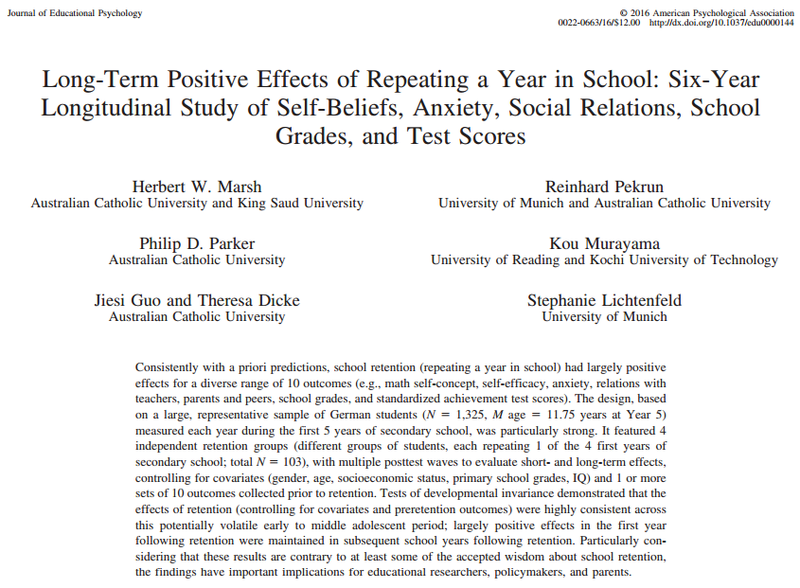 All outcomes which include math self-concept, self-efficacy, anxiety, relations with teachers, parents and peers, school grades, and standardized achievement test scores benefit not just in the short term from retention. Of course, the above results are not expected to be easily transferable to a society that has long regarded retention as a bad thing because, sadly in this case, our perception does matter. 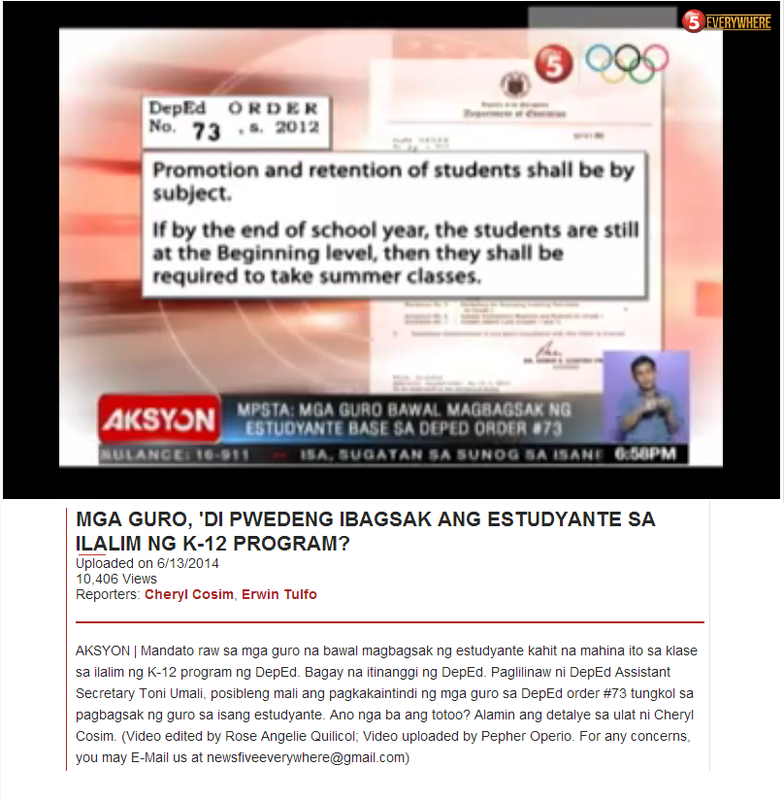 Unless we focus on the fact that a school's job is "to ensure all students learn at high levels" and unless we stop perceiving basic education as a contest or race, retention will remain detrimental and we will never find a better alternative to address the needs of academic underachievers.